Wow - I just realized I haven't done a substantive modeling update since October 23. Unfortunately, work got especially busy during that time and whatever hobby time I had I've mostly spent working on layout & backdrop photography. Thanks to some great help from Brooks Stover, I've been improving - though still nowhere near where I want to be. Fortunately, "backdrop photography" consisted of something I am actually proficient at - taking pictures outdoors. So I took advantage of the teeny tiny foliage season to get some more shots I can (hopefully) use for backdrops. Not a "backdrop photo" but something I saw while out shooting landscapes for same. I also had a visit from Don Janes and Greg Stubbings and was able to host a quick ops session with Greg, while Don took photos (unfortunately, I didn't get any photos myself - but hope to be seeing Don's pics soon!). They were down from Canada visiting New England and were in the neighborhood - click here for Don's report on their visit to the Valley RR. As for modeling, unfortunately, the B&O flatcar and Rt. 15 bridge are still in primer, ready for the next step. 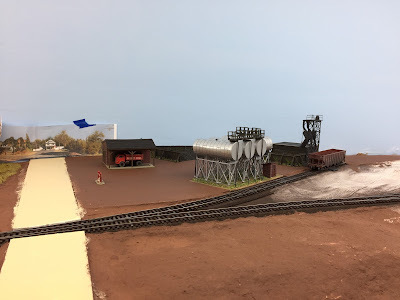 But I did get some layout work done, thanks VERY much to DaveM for some additional Valley Coal structures, thanks to scenery help from Bill and sadly-blogless-Pete, and thanks to a looming scheduled ops session hosting folks from the NMRA/New England Region Convention in Newport, RI. The photos tell the story . . . In addition to the Valley Coal office and oil tanks, Dave also sent models of the coal bins and garage - built according to what prototype photos I had available and a plot plan I'd sent him. They all arrived recently and I started doing a final mock-up of the scene. Once I got everything in a good place - and as close to prototype arrangement as practicable - I decided to raise the terrain with foam core so that it would be more in line with the tops of the rails (thereby "sinking" the siding) and cut some openings to accommodate the masonite structure bases. Then it was a matter of adding Ground Goop to feather everything in (hiding the edges of the foam core, primarily) and painting the foam base to make things look a little nicer (and to prep for further scenery materials. Meanwhile, Bill worked on modifying/sizing/printing a photo backdrop for where Middlesex Turnpike hits the masonite in the Goff Brook scene. Here he's creating a fillet of paintable caulk to feather the edge between the 3D road and 2D road on the backdrop. Trucks sitting in front of Gra-Rock, on the site of the old passing siding across from the Wethersfield station. Just because you need to move details and such out to keep them out of harm's way doesn't mean you can't set up a little mini-scene in the meantime... And it's a great way to keep motivation high. Pete and I also got back to the East Berlin scene to add Ground Goop and get it ready for further scenery. Turns out, we worked so fast that this is the only shot I got of the progress - I promise more pics later. While it's always nice to show some additional layout progress to my regular operators, I have to remember that the NER guests will not have seen the layout in person yet - so everything will be "new" to them at least. That realization kept me from getting too stressed about getting a lot more accomplished - but knowing they were coming still gave me a timely kick-in-the motivation to press ahead a little further at least. So what's next? Ah - there is SO much to do. I'd like to finish up the B&O flatcar, as well as teach myself resin casting so I can copy the girder parts for the Rt. 15 overpass (thanks to Don Janes for the encouragement to try casting...) and get that done. And I really want to maintain my motivation to do scenery - something that's always been a major hurdle for me. Thanks to Bill and Pete, I've got a good start - I just have to keep pressing forward (and finally try out that static grass applicator myself - are you listening Ted?). Steam decoderization is waiting for decoders, and I still need to dial-in the installs I did recently. Get to planting that grass!